Mechanics examines and describes rules of motion. On this page examples are about classical mechanics. Classical mechanics is applied when examined objects are big and when their velocities are small in relation to speed of light in vacuum. If mentioned conditions are fulfilled then results obtained via classical mechanics theory are true with experiment results. To describe phenomenas of motion for very small objects which are comparable with atoms or elementary particles we have to use quantum mechanics. For objects which are moving with velocities close in relation to speed of light, we have to apply relativistic mechanics which is described by Einstein’s special theory of relativity. 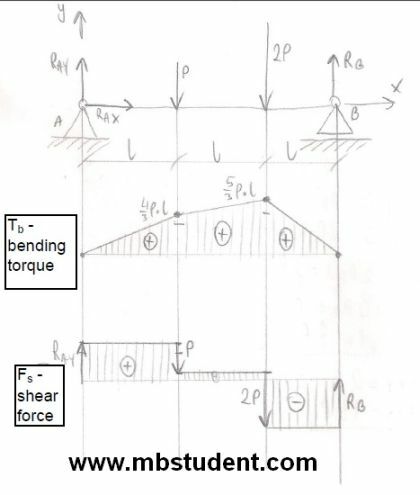 You can find here a lot examples from mechanical engineering and strength of materials. Every example is solved step by step. Solved examples from mechanics statics. Collection of exercises in which equilibrium equations are designated. During exercises we examine how forces affect to bodies and material points when they are resting. In statics we used to examine how vectors of forces should be directed to keep body in equilibrium. In most elementary examples we treat examined objects as a material points. Material point is a special model of body which has only a mass with no volume(V=0[m3]. Real physical objects are called rigid bodies. 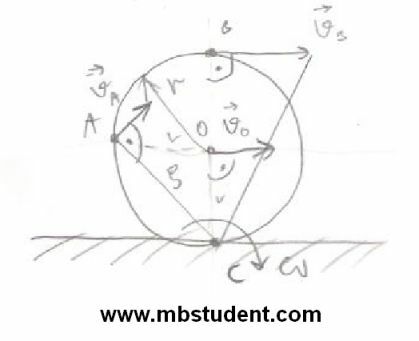 If we examine forces which work on rigid body then we have to remember to place a gravity force vector (m·g) in rigid body’s center of gravity C. Center of gravity is a special point of rigid body. Rigid bodies usually have irregular shapes. If we rotate a rigid around axis which goes through center of gravity point then rigid body stays in equilibrium. If rigid body will be rotated around any other of its points then it will start moving. Cause of motion beginning is an unbalanced force which has appeared. Solved examples from mechanics kinematics. Designation of motion’s trajectory for various type movements like: linear move, rotary move and others. In kinematics we used to calculate relations between passed road, velocity, acceleration and jerk. Velocity is a derivative of road. Acceleration is derivative of velocity. Jerk is a derivative of acceleration. All mentioned magnitudes ae time functions. We distinguish a few types of motion. We divide motion in subject to trajectory shape. As a result we find rectilinear motion and curvilinear motion. Specific cause of curvilinear motion is rotational motion. It is also possible to divide motion its dependency to time. In this case as a result we find uniform motion and uniformly accelerated motion. Solved examples from mechanics dynamics. Collection of examples where we examine forces which work on bodies and material points when they are in motion. 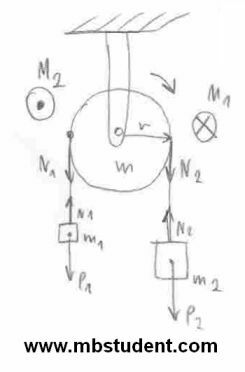 We desigante accelerations, velocities and other parameter of move using Newton’s laws of dynamics. As it is known from school there are three Newton’s laws of dynamics. When there are no forces which work on body or forces are working but are in balance then body doesn’t move or moves in uniform motion. When on body works unbalanced force the body moves in uniformly accelerated motion. 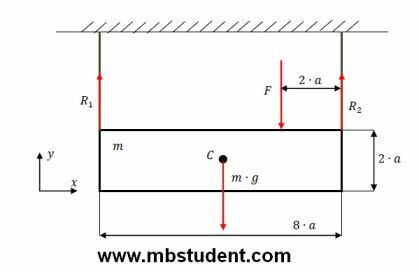 Acceleration of this motion is straight proportional to force F and inverse proportional to mass of body m.
If body A works on body B with force FAB then body B works on body A with force FBA. Force FBA is equal in value with FAB, but has opposite direction. FBA=-FAB. Harmonic motion is one of the basic type of motion in nautre. Plenty of bodies and items execute harmonic motion during their normal existence. First example of harmonic movement which you should know is motion of pendulum. There are two models of pendulum. First model is mathematical pendulum which is only theoretical model. 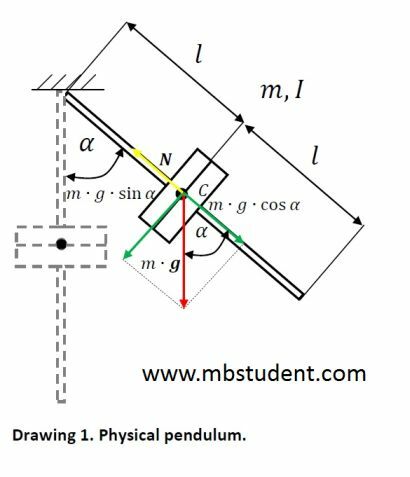 Second model of pendulum is physical pendulum. The most basic harmonic motion example is motion of harmonic oscillator. Simple harmonic oscillator is a mass hanged on spring.